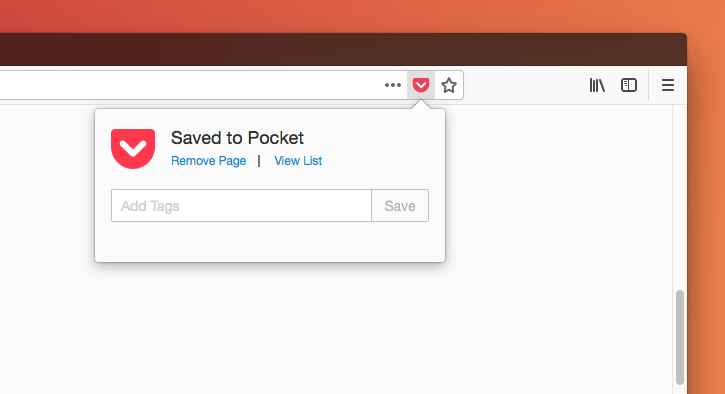 The Pocket button in Firefox lets you save links, articles, videos, or web pages to your Pocket account with a single click. Continue reading to learn how save to Pocket and access your list in Firefox. Please note: We are currently tracking two common issues with Pocket in Firefox. If you’re having trouble saving or are unable to find the Pocket button in Firefox, please follow the links below to learn how to get this fixed. Our apologies for the inconvenience! If the Pocket button is missing in your Firefox toolbar, please click here for some tips to bring it back. If you’re trying to save to Pocket but are being asked repeatedly to log in, please click here to learn how to adjust your settings so you can remain logged into Pocket. An account is required to save, view and sync content in Pocket. You can sign up for Pocket with either your Firefox Account, Google Account, or your email address. To learn more about creating an account, click here: Creating an Account and Logging Into Pocket. If you already use Pocket, please do not create another account. Instead, click the Log In link and use your existing account information. If you’re having trouble logging in, please click here. When you find a page you’d like to save, simply click the Pocket button in the Firefox address bar. When you click the Pocket button, you will see a message to confirm that the item has been saved. Firefox’s Reader View now contains a Pocket button as well. The save confirmation that appears after saving item has a text box that makes it easy to add tags to the item you just saved. Tags are like labels: words or phrases that you use to group items together in Pocket. Because an item can have more than one Tag, Tags are a flexible way to organize the items in your Pocket. To add a Tag to an item, just type it to the Add Tags text box. You can add more than one tag if you type a comma (,). Then, click Save to save your changes. Changed your mind about that page you just saved? No problem! Just click Remove Page confirmation message. You’ll then see a message confirming that the page has been removed. 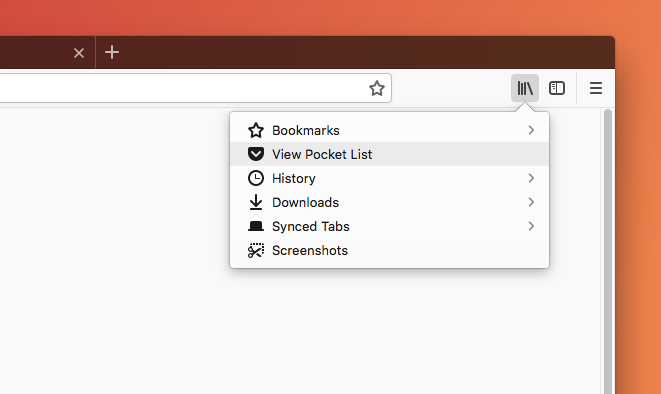 To view your list of saved items in Pocket in Firefox, open the Library menu and select View Pocket List. To make Pocket even more easily available, we recommend pinning the Pocket tab in your browser. Just right-click (or control-click) on the Pocket tab, and select Pin Tab. Click here to to learn more about Pinned Tabs in Firefox. Can I use Pocket offline, without an internet connection? While it is not possible to use Pocket offline in the Firefox browser, there are apps available for your computer that offer offline access. Click here to learn how to access your saved items while offline on your computer. I no longer see the Pocket button in my toolbar! How can I get it back? If you can’t find the Pocket button in your Firefox toolbar, please click here for a helpful guide explaining how to get it back. Every time I try to save to my list, I'm being asked to login. How can I fix this? Pocket may have trouble keeping you logged in if you use increased privacy settings. Click here to resolve this issue.